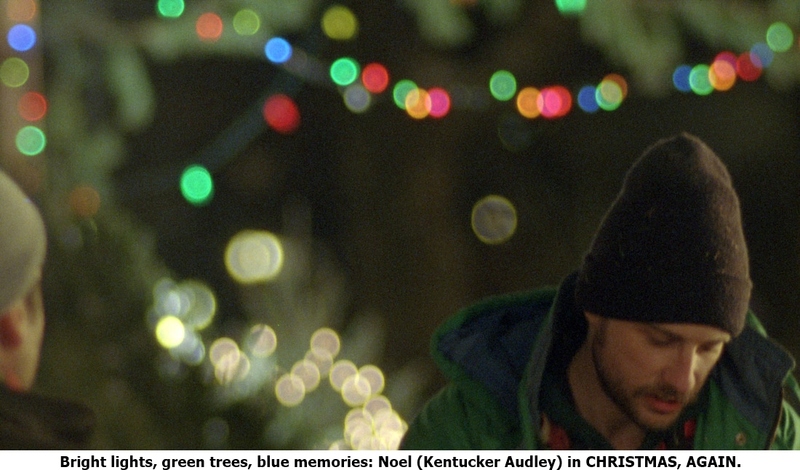 Charles Poekel’s evocative, downbeat Christmas, Again, a Yuletide tale of the heartbroken manager (Kentucker Audley) of a 24-hour tree lot enduring a cheerless season, is a film like no other. The story of isn’t autobiographical, but it is steeped in the writer/director’s own experience, lending the drama a heightened sense of reality. Now out on in a limited theatrical run and on VOD, Christmas, Again is also up for an Independent Spirit John Cassavetes Award, given to the best film made for under $500,000. The film made its US premiere in January at the Sundance Film Festival as part of the Next program, and Poekel was full of anticipation for that stateside debut when he talked to me about his unusual first feature. Q: Why a tree lot? Is that someplace you worked? Charles Poekel: Yeah, I actually started my own tree lot. I ran it for about three years while I was writing the screenplay so I would know firsthand what it’s like to work in the shop and try to get into the character better. Q: Where did the story come from? It is inspired, the idea of getting to know this guy that you see briefly once a year. Q: It seems like such a specifically New York story, even the idea that the lot is open 24 hours. Charles Poekel: I think it has to do with the fact that it’s so concentrated of a city that most people don’t have cars and so they are restricted to buying trees at the closest place to them. There aren’t really large lots to fence in or anything. Q: At what point did you actually start writing your story, before or after you started selling trees? Q: Your film isn’t so dialogue-heavy. There are so many quiet moments where it’s just Noel. Talk about the importance of casting Kentucker Audley in that role. Charles Poekel: Of my goodness, [casting the role] literally kept me up at night, because…the camera’s pretty much on him throughout the whole movie. There aren’t that many movies where your main actor is so much a part of it and it’s so hard to carry a movie just on one person’s shoulders. We were really fortunate that Kentucker loved it and did such a great job. There aren’t many people that could do that. Q: What was it like shooting like that on a tree lot in the middle of New York? Charles Poekel: I think, in many ways, the weather was the biggest challenge, but in many ways, it wasn’t. Obviously, it was freezing outside and we didn’t have any place for our crew to be. We could only fit a couple of people in that trailer. Even when we were shooting scenes in the trailer—our crew was only, I think, eight people—three or four would have to stand outside and wait until we finished the take. The adjacent buildings were nice enough to let us in and stay warm. The weather was kind of the most annoying part, because it was constantly cold. It was a really cold December. But that stuff people can work through. You find ways to get through it. But also working with non-professional actors was challenging, as well. It’s difficult to rely on them as much, as far as showing up and preparing their lines as they were supposed to and having them do takes again and again and again. It difficult, but it’s ultimately very rewarding. Q: How was it making a film and operating a tree stand at the same time? Charles Poekel: It was fun. One of the reasons it took me so long to make the film was the first three years of running the tree stand, it took me—the first year was pretty crazy, the second year was a lot better, but I was still kind of fixing things. It was really the third year of selling trees, while I was finishing up the script that I felt, ‘OK, this is a turnkey operation now. I can definitely shoot a movie and have people helping out at the stand, selling trees, and not feel like my head would explode.’ I thought it was pretty fun, actually, and pretty much everyone in our crew, at some point, sold a tree. Sometimes we’d have to stop a take and help a customer. A few times we even asked a customer, ‘Hey, do you mind? We’re making this movie. Would you mind if we filmed you buying a tree? Do you want to be in it?’ So a few of the customers actually made it into the film. Q: Did they get a discount on their trees?